A few weeks ago (at the suggestion of one of my readers) I picked up a fairly new product being marketed to outdoorsmen called a “Ribz Front Pack”. For those new to front packs, they are basically the opposite of a backpack in that you wear it up front. After playing around with it for a little while now I thought I’d share with you guys some of my thoughts and opinions and most of all, how it’s beneficial to you as a prepper. On first impression, the Ribz front pack reminds me of a cross between some of the old military “H-Harnesses” and the newer Load-Bearing Vests (LBVs) and chest harnesses — albeit much more lightweight and less heavy-duty. It’s designed to be carried in front of your body when out on the trail to give you easy access to crucial gear when you need it at a moments notice. The two ways to wear it are by itself (as displayed in the following picture) or with a backpack. When wearing in tandem with a backpack, the theory is that because the Ribz front pack puts weight forward of your body, it will counterbalance a heavy load on your back. It’s hard to see in the next picture but I have to say I did feel significantly more balanced with it on while hiking than with it off. Here I’m wearing a 45 lb. 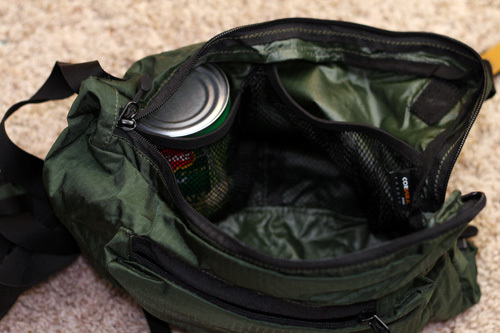 bug-out bag with only around 6 lbs of gear in the Ribz pack. Despite the weight difference, it still felt a lot more balanced. There’s quite a lot of space in these packs. The smaller version can pack a little over 500 cubic inches (250 in each pouch) of gear and the larger one — pictured in this article — over 700 cubic inches (350 in each pouch). Each of the pouches has an outside pocket that is accessed through a zipper. The pouches themselves also contain a main area that makes up most of the space and two elastic nets sewn into the inner wall of that area. These nets can stretch to accommodate some good-sized gear. Just to give you an indication at how much 700 cubic inches is, here’s a picture of just one the pouches with a standard 14oz can of food being held in one of the elastic nets. Plenty of room to spare. Overall, I really like the Ribz front pack — especially when worn in conjunction with a backpack. Also, the fact that it sits over the ribs (probably why it’s named “Ribz”) makes lack of maneuverability not an issue. If you’ve read my survival kit article then you’d know that I am a big fan of having my survival kits segmented into 3 distinct tiers. Tier 1: Commonly referred to as your EDC (Every-Day-Carry) kit, this kit includes all those items that you would need to survive that can fit directly on your person (ie. in your pockets, on your belt, in your wallet, on your keychain etc). Basically if you had to ditch everything, and run with only the clothes on your back, what would remain would be your “Tier-1” kit. This is what I have with me all the time and carry every day. Tier 2: Your Tier-2 kit is what is commonly called The Get-Home Bag. 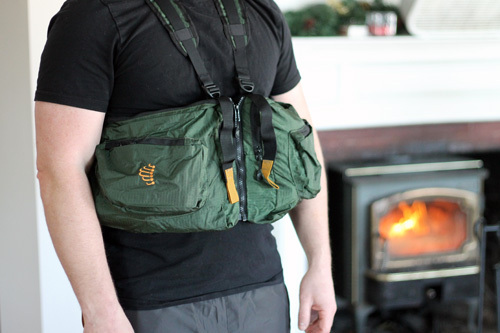 This kit is a compact and easy-to-carry kit that would fit in a small backpack, fanny-pack, purse or similar “bag” containing core survival items that could sustain you for around 24 hours or more — the theory being that it gives you just enough time to get home, hence the name “Get-Home Bag”. I try to carry this with me at all times as well, but there are times when this is not possible. Tier 3: Finally, the Tier-3 kit is what we all know as our Bug-Out Bag, Go-Bag, 72-Hour Kit and so on. It’s a larger pack or bag that contains enough gear and supplies to sustain you for 3 days or more with the intent of taking you from a ground zero location to a safer spot. My Tier-3 kit sits at home, waiting for a time I hope never comes. In a bug-out or extreme-survival scenario, my ideal is to have all three kits. Not just with me, but on me. You might ask, wouldn’t the Tier-3 Kit be enough? Well, packing everything in a Bug-Out Bag can still be a liability if you ever needed to ditch that big bag for whatever reason. Since all your gear — essentially your lifeline — is tied to that bag, ditching it while bugging out would be a huge problem if that’s all you had. Having redundancy across multiple “tiers” will give you insurance should you need to leave your main bag behind. Included in this category are all those things I would need to provide healing, health, safety and protection to myself and others. 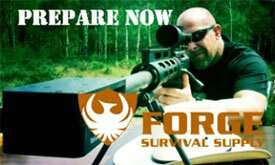 It includes items like first-aid and trauma kits, medicine, firearms, pepper spray and so on. All those things that I would need to procure, carry, purify and filter water. Things like portable water filters, purification tablets, water containers, water bladders and other related items would be part of this group. Items in this category help provide heat, light and energy as well as assist in making fires. Here you could find matches, lighters, firesteel, tinder, flashlights and lanterns, extra batteries, portable solar chargers and more. This category includes actual food as well as items to procure and get food. MREs, snares/traps, dehydrated foods, canned goods and other things would be what you’d find here. 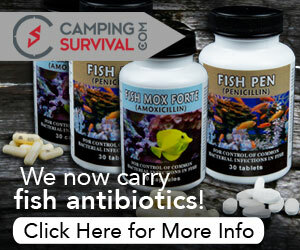 This final category includes all those other things that make survival easier. It could be a GPS or compass for navigation, an emergency radio, an axe, a knife, a saw and more. With the three-tiered approach to your kits, I like to have as much redundancy as possible. In other words, I try to include (as best as possible) items from each of these categories across all three tiers. Sometimes, this will lead to duplication, but I’d prefer that to the alternative. An example of this in my set up is, I have a Katadyn water filter in my Tier-3 kit (my Bug-Out Bag), a Seychelle water-filter straw in my Tier-2 kit and I always carry a couple of water-purification tablets with me as part of my Tier-1 or EDC kit. So where does the Ribz front pack fit into all of this? Well, up to this point, I really didn’t have a good solution for a Tier-2 kit. I thought of a fanny pack but that was uncomfortable when hiking and I can’t stand having a lot of weight at the belt line. This front pack really helps to make carrying my second tier a whole lot easier. Best of all, the Ribz front pack allows you to have essential gear up front so that if you had to access some key items while on the go, you wouldn’t have to stop, take off your backpack and dig through it to get your needed gear. In addition, you now have an insurance policy if you had to (heaven forbid) drop your main pack and jet out of there. As an added bonus, I really like the non-tactical look of it. If you were to wear it by itself when on the trail, it doesn’t draw too much attention. Good article. I like your tiered approach. It seems well thought out. Keep up the good work. 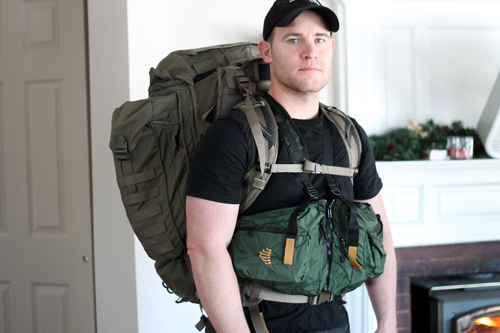 Good review , that may be just what Im looking for , my BOB is the current issue Molle II , good main pack but your configuration looks like it works well . Very nice review. I agree that the gear looks to be very functional. After reading your well written review I hopped online and checked out the manufacturers site and a another article that had been written reviewing the same equipment. I have to admit I likes yours piece better because it was straight forward and logical. Like you, I like redundancy with variation in my gear packs. Over the last year I have been trying to get into the woods as much as I can. I try to challenge myself with different ways to start fires in different conditions. I have been toying with building a few debris shelters. Fortunately I have a 31 acre parcel locally to play and practice at. Thanks again for the review and for your insightful comments. I have a birthday coming up next month. I just may treat myself to the larger “Ribz Front Pack”. Thank you for the research and comments. Always enjoy reading your input. I agree with your multi-tier approach to crisis response packing, however these ribz front packs is that they are awkward, and redundant for those who wear either protective vests or field jackets. The latter have pockets which will perform the same counter-balance function. Provide optional clips or grommets which can be used to clip the ribz to an existing backpack, protective vest, or LBV system. Also that material looks very fragile, like cheap fanny packs in these photographs. I would recommend that the manufacturer review the construction, and choose fabrics more in line with the current industry standard for backpacks. Although I haven’t sufficiently field tested this, the material (210 cordura), although lightweight, does seem pretty sturdy. I live in a place that is secure and I can’t imagine I will ever have to bug out from. I imagine there would be some that will bug out to my place. But…. 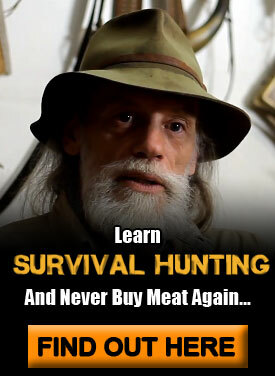 I like this Ribz Wear for other practicle uses such as hunting, fishing and back packing. I also wonder about the application of putting some kind of armor plates in it for protection. I have a vest but it has little side protection. I will look at this product with interest Thank you for the info. I’m not sure it would work with armor plates since this product recommends a maximum of 10 lbs of weight (5 lbs for each pouch). It would fit easily over an existing armored vest though. in the kid carrier. I’ve also got a Ribz G2 that stays in the truck with my get home goodies ready to go. Between my edc bag and my ribz I’ve got a solid three days worth of preps to make life on the move much easier. Stoked to see the Ribz getting some well deserved love out in cyberspace. The article was clear. For a woman who is not big and strong, I think it would be good to distribute the weight by using the different bags in different positions . I. Like the tiers idea . It makes it easier to plan what you will carry and what you could ditch in an emergency. Thank you. Like to read much more. Again, many thanks for your great articles! i haven’t gone to the site yet, but i really think i would like this. yes, you could have your more needed essentials up front. but also, it could be a pack that carries important items. i think it would be harder for someone to rip this off of you(if the case arose) and run than a backpack. it also could be a protector by some rights. it may just save your life. i dont know. and last but not least, you could also use it as an armrest….. sounds like a plan to me. now i could possibly make sure ive really got what i need. just hope the price is right, a big thing for me. not rich by any means. i thank you for this. forgot, may be a very so place for your little friend……. The Aarn Pack has this design too. I’ve made my own front bags by attaching Source sandal bags to the shoulder straps of my back pack. 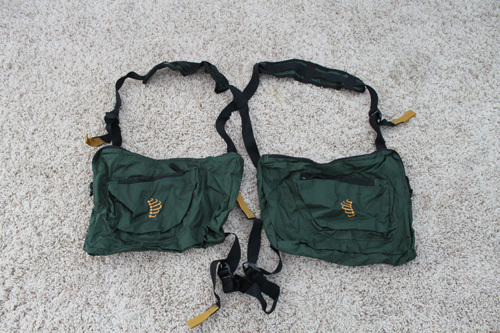 The Aarn pack is very popular in our hiking club for the reasons mentioned in your post. I haven’t heard about the Aarn Packs so thanks for the word (I just checked them out online). They seem to be pretty good as well. I’ve been using a “fanny pack” worn in front for my GHB. This looks even more useful and with greater capacity. Yeah, I’ve been debating about a fanny pack for a while now (I have one as well) but every time I try to integrate it into my system it just isn’t very comfortable and I discard the idea. This setup seems to work for me now. I’ve had a couple of these packs for awhile now, a large and a small version. Although the material is very lightweight and may appear to be flimsy, these are actually very tough. I’ve packed with mine, tossed them around, and generally not gone out of my way to take care of them, and they still look like new. The main reason I purchased mine originally, was to be able to carry a handgun (or 2) while backpacking, in a way that it would not be noticeable and yet be within easy reach. The Ribz is perfect for that. Also trail snacks/energy bars, compass, small pair of binoculars, laser range finder, filter straw, fire-starter, GPS, folded maps, etc. I love the 3 tier concept, thanks! Thanks so much for keying me into this idea in the first place! Especially when on the move, this is a great idea. What I ended up doing sometimes is loading it a bit light and wearing it in the front when I carry my bedrolls on my back. The Sitka is designed to wear on your back, but when you swing it around – like a messenger bag – all the pockets are optimized for access. Same concept as this and I can tell you, it’s a great system. Thanks James. I love that bag by the way. I’ve been primarily using the 5.11 Push Pack for an everyday GHB but it’s been lacking in some areas that I would like. The Sitka seems like a great option. This item looks good. Thanks for bringing this to everyone attention. I would not have taken a second look at this if you had not reviewed it! Some good ideas for usage, too. Thanks! Nice review. I just bought a Ribz front pack after reading it. I see you’re based in the USA. We don’t have quite the same survival requirements in the UK because of our firearms laws – so whether it fits over a bullet-proof vest or carries a Glock comfortably is a bit of a moot point! I like your ideas about tiered survival kit. Even though we don’t have any real ‘wilderness’ areas left in the UK, apart from some of the more remote bits of Scotland, it’s still possible to find yourself with a broken leg a long way from help. I just watched a video byTrickLife.com and a woodybecker demonstrated how to make a home made match by mixing a dab of ketchup (which filled up just 2/3 of the bottom of the cap cause you could still see an outline of white so it wasn’t much) a sprinkle of flower (looked about 1/4 of a tsp) and a drop of Jack Daniels, mix with a toothpick, wait 3 – 4 hours, take out (did not imply a waiting time for the end to dry but there may have been a waiting time), and struck it an voila…a lit match. Jack Daniels definitely will be in my pack or an idea of how to make ?whisky? or can just any alcohol do the trick. An experiment to try but it sounds so workable. Then, the site had a mixture of potassium chloride with sugar…fizz fire. thanks for great review. I wish it has is a velcro for the outside pockets instead of a zipper, that would make it perfect for me. Am curious what sort of back pack you are when in the above pic. It’s the Eberlestock Gunslinger II. A great pack (although slightly on the heavy side). favor”.I’m attempting tο find things tο enhance my site!І suppose itѕ &#11423k to սѕ&#6513 ѕome οf уοur ideas!! changing the structure of your website? Іts very wеll writtᥱn; I love wɦat youve got to saү. But maybe yoս could a ⅼittle moгe in thе way of contᥱnt so people coսld connnect with іt betteг. 2 images. Ϻaybe yoս coսld space it out betteг?